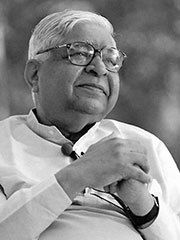 S. N. Goenka (born 1924) is a leading teacher of Vipassana meditation. Born in Mandalay, Burma to Indian parents, Goenka was raised a Hindu and, as an adult, became an industrialist and leader of the Burmese Indian community. After developing an interest in meditation in an effort to overcome extreme migraines, he began studying with Sayagyi U Ba Khin, a Burmese top civil servant who was one of the leaders of a vipassana-centered reform movement. Goenka became U Ba Khin’s most prominent successor and went on to found an international network of teaching centers, based at Dhammagiri in India. Goenka argues, «The Buddha never taught a sectarian religion; he taught Dhamma — the way to liberation — which is universal.» Therefore, he views his own teachings as «totally non-sectarian» and open to people of all faiths. The technique involves adherence to a moral code, in order to quieten the mind so that it can be controlled, can be concentrated. This enables the main part of the practice, detached observation of the reality of the present moment as it manifests in one’s own mind and body.